We have a dandelion problem in our yard. Perhaps it could be because my daughter obsessively blows dandelion seeds across the lawn whenever we get a chance. And perhaps it is because Greg and I can’t muster up the concern to address that tendency. 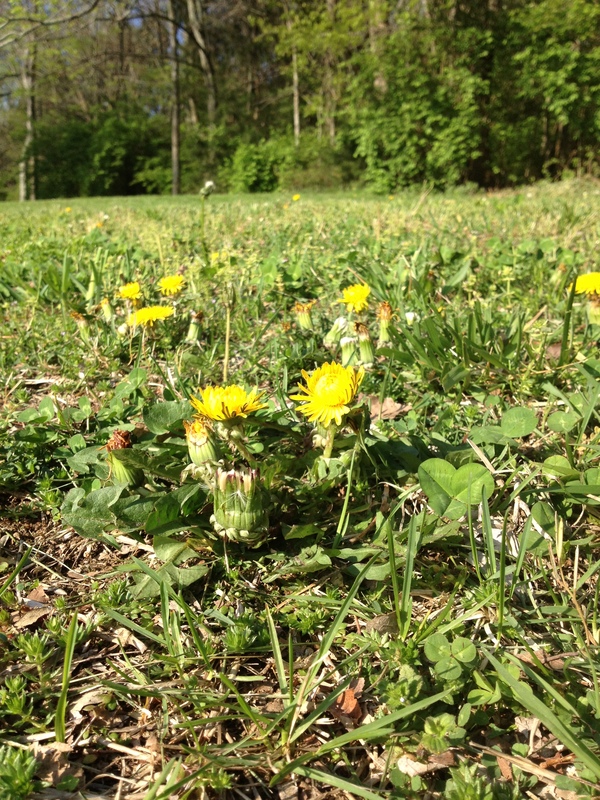 Regardless of the cause, the result is that bright, round dandelions are scattered across our backyard. I’ve been amazed at how fast they grow. Greg mowed the yard on Saturday afternoon. When I pulled in the driveway after church on Sunday, there were more than a dozen seemingly full-grown dandelions waiting to greet me. Her comment made me pause and think. Why is it that we disdain dandelions so much? Yes, they use up too many nutrients and keep one’s yard from being uniformly green…but why must we have uniform yards? Who decided that uniformity was beautiful? 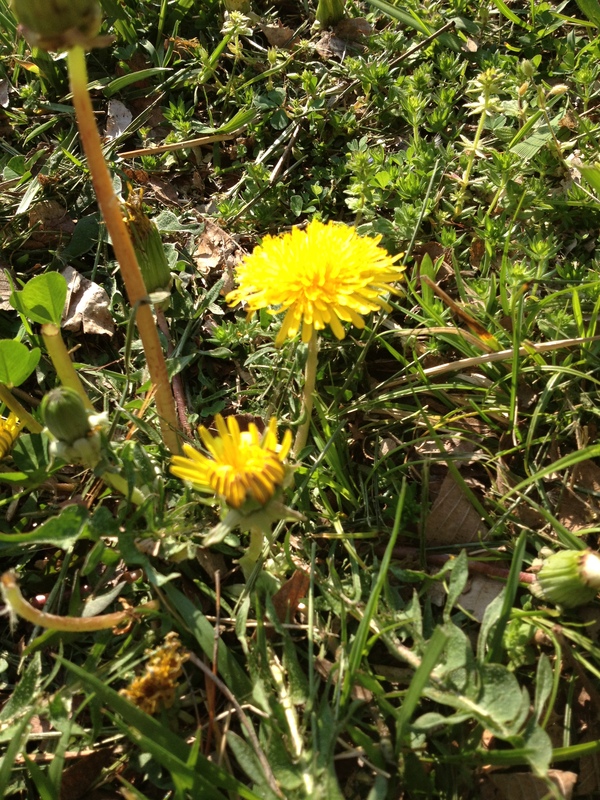 Besides, dandelions are pretty–really! If they were a rare flower that took lots of work, I think we would admire them a lot more. And yet, because dandelions take no effort, because they grow overnight where we don’t want them to grow, we resent them. Isn’t that curious? We love flowers that we control, that we work for, that we coax into blooming. We love the ones that stay in our neatly ascribed garden boundaries. But wild dandelions, which don’t ask our permission before gracing us with their beauty, draw our wrath. I’ve noticed the same thing with weather. Lots of people like crisp air in autumn. Others love beautiful snowy days in winter, or warm spring days, or the hot days of summer. But what no one seems to be able to stand is summer days in autumn, winter days in spring, or overly warm days in winter. In short, we like the various types of weather, but in our minds, they must be in their proper season. Case in point: this chilly spring has been driving everyone crazy. If the calendar says April, daggonnit, then it’s supposed to be warm!! A cold day is all well and good when it is January; then we might make a fire and sip hot chocolate and enjoy it. But in April?? Forget it! Basically, we like our weather patterns to be predictable, controlled. And when they don’t fit into our preconceived notions of seasonal appropriateness, we rail against them. But a cold day has just as many possibilities in April as in January. And a warm, balmy one should be no less enjoyable in October than in May. And a dandelion is beautiful. Even if we can’t predict and control it. Pondering the dandelions yesterday afternoon made me realize the different “dandelions” that pop up in my life: those things of beauty that I resent, just because I can’t control them. Take waiting, for example. So often, my life seems so busy, so chaotic, and I would just love a chance to sit and be quiet, to calm my thoughts and ponder and reflect. Such moments seem to be in short supply, and I am constantly scheming of ways for my life to slow down. Until it does slow down, at a traffic light or a carpool line at tutorial or a waiting room. Then, suddenly, I have a few seconds to myself–moments where no chores beckon, with no items on my to-do list able to be knocked off. I have a few moments to sit and think. And do I enjoy these moments?? No. I don’t. These moments are dandelions. I can’t control them; I didn’t choose them. Thus, I don’t want them. Apparently, I want quiet time on my terms, when I am fully prepared for it. I want quiet time on my couch, surrounded by my books and notebook, not here in my car in the middle of traffic. Yes, they are moments to think, to pray, to ponder, to refocus. But I don’t appreciate them. I find myself resenting these “time dandelions” instead of marveling at their fleeting beauty. Or take moments with my kids. I love times of connections with my children, times of snuggles and good conversations. That’s a big part of why I homeschool. I love to spend my days reading to my kids, talking to them, and playing with them. Unless, of course, I’m in the middle of another task. In that case, I grow impatient when they need me, and resent when they persistently demand my attention. Often, these spontaneous interactions, these dandelion moments, could lead to bonding and beauty–if I have the wisdom to embrace them. And that’s my challenge for myself today. I want to appreciate the dandelions in my life, the little moments beyond my control. I want to see the beauty in a life that I can’t fully plan, a life that keeps surprising me. I want to embrace opportunities to rest and opportunities to love, even if they aren’t in my perfectly manicured garden–er, I mean schedule. “I can’t control them; I didn’t choose them. Thus, I don’t want them.” Perfectly put, Kim. Time is precious, so why do I disdain the dandelion moments?